Who ever heard of a user guide for a Swiss Army knife? But worry not, we have compiled a fairly thorough quick-reference list of FAQ for Pic Scanner Gold. If your question isn’t covered here, do email us – we will respond right away, and will also add it here so it can help others. Why does Pic Scanner Gold want permission to use Camera and Photos? We use the camera to scan photos, and need access to Photos app when you save photos to it, or want to import photos into Pic Scanner Gold. This does not compromise your privacy. Scans are blurry. Camera won’t focus: Camera is designed to auto-focus within a second of pointing it at the photos being scanned. If not, tap the screen to focus. Scans don’t look bright or sharp: Just follow these 4-5 illustrated tips and you will get pro quality, high-resolution scans. If you are using iPhone 6 / iPad Air or newer devices, also check that High Resolution Mode is enabled (Menu > Info & Settings > Quality Control). Why is scanning process different from that in Pic Scanner? Pic Scanner Gold is faster and more streamlined! It also shows you how each photo is cropped and saved. Do a few practice scans, and you’ll love it. What is the blinking circle in middle of the scanner screen? A leveling tool. If you put photos on a level surface, the iPhone or iPad should be parallel to them while scanning. The thick part of the circle shows which side needs to be lowered. When the device is roughly level, ‘OK’ flashes in the circle. You can turn off this tool in Menu > Settings. I have scanned many photos. Now I get a message to delete original photos. What is this? Just an alert that the app is using a lot of space, and you could free it up by deleting unneeded Originals (Gallery > tap Originals > select and delete uncropped images). If you want to keep them, tap Menu > Settings & Info > Space control > move slider to the right. Where are cropped photos saved? In Photo Gallery. From any screen, tap Menu button (top left) > Gallery. Do remember to periodically back them up to your computer or a cloud service. Can I disable automatic cropping? Auto cropping is a big effort-saver. If you follow the tips in this post, cropping will be very accurate. If you really must use un-cropped photos, transfer them from Originals to Gallery screen (Select > Move). Can I add pictures from Photos app to Pic Scanner Gold for editing or putting in albums? Of course. 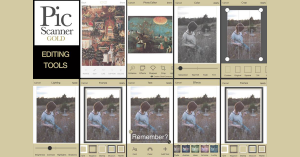 In Photo Gallery, tap Import and select the photo to be fetched. I rotated a photo and then edited it. But my changes were not saved. Save the photo after rotating, then tap Edit to edit it – and tap Save again when done editing. What do the various editing tools do? I am confused by some of the names. For a complete guide to Pic Scanner Gold’s editing suite, please click here. How to save scanned pictures to Photos app or Dropbox? Tap Select on Gallery screen > select thumbnail(s) > Export > From sharing options, select Photos, Dropbox or others. How to share photos from Originals screen? On Originals screen, tap Select > choose photos > tap Move. Photos are saved on Photo Gallery, and you can share them. How to export albums together with captions? You can share mini-albums: Create an album, add captions, then in Goodies, select Shareable Albums. Follow the on-screen instructions. Where are the photos I uploaded to Dropbox? In Dropbox > App > Pic Scanner folder. How to transfer scanned pictures to computer? In Photo Gallery, tap Select > choose photos > Export > In sharing options, select Photos. If you have iCloud / Photostream enabled, photos will automatically sync to iCloud and your computer. Does Pic Scanner work with OneDrive, Google Drive, Google Photos, Box and other cloud services? Tap Select on Gallery screen > select thumbnail(s) > Export > Sharing options > Show all > Choose your preferred cloud service (Must be installed on your device). Trying to post 50 photos to Facebook but can’t. Why? Facebook imposes a limit of 30 photos (or 29 photos + 1 video) on posts from other apps. Method 1. Create new album: Gallery screen > Albums > Create new album > Type name of album > Save > Empty album is created. To add photos, tap the empty album > Add photos > Cropped (On top of Albums screen) > Select photos > Done. Photos will be added. Method 2: Gallery screen > Tap photos to be put in the album (They’ll get tick marked) > Add > Add to New Album > In pop-up box, type name of album > Save > Album will be created. How to add more photos to an existing album? Gallery screen > Select > Select photos > Add > Add to existing album > tap on the desired album. I am adding photos to albums. How do I know which photos have already been added and which I haven’t? In Gallery, select all the photos you want added to album > Albums > Add to existing > Select album. This will add only photos that aren’t already in the album, without duplicating those you had added earlier. How to delete an album? On Albums screen (The one that shows album covers i.e. names and number of photos in each album), swipe left on the album to be deleted > Delete. How to make photos into a photo book or calendar? Save photos to Dropbox or computer, then upload them to your preferred photo service’s website. If you have their app installed, you may directly upload photos by tapping ‘More’ in sharing options, and then selecting their app. How to play/mute music during the slideshow? Tap the screen while slideshow is playing. A bar appears. Tap the loudspeaker button to toggle sound on/off. How to create a slideshow using some scanned and some already-digital photos that are on my iPhone/iPad or computer? Method 1: Save photos from Pic Scanner Gold to Photos app on your iPhone or iPad, and sync to computer > Open iPhoto, and follow this easy tutorial. Method 2: Import photos from Photos app into Pic Scanner Gold > Create an album containing scanned as well as imported photos > ShowTime. How much does the app cost? 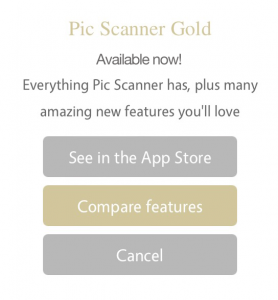 Pic Scanner Gold costs US$4.99 (or your currency equivalent, as determined by the App Store.) This one-time charge enables unlimited use of all standard features of the app. Can I try out the app before buying? 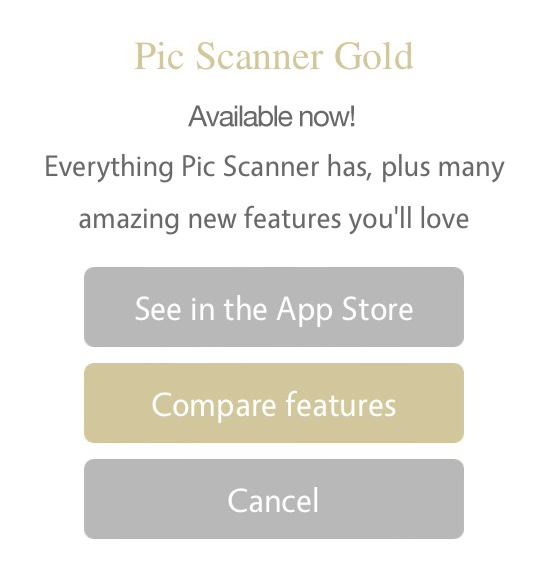 Pic Scanner Gold requires an upfront purchase, but if you are not fully satisfied with the app, you can get a full refund. I already use Pic Scanner. If I buy Pic Scanner Gold, can I transfer photos, captions and albums from old to new app? Yes! Download Pic Scanner Gold on the same device. Launch Pic Scanner, tap Menu > Info & Settings > Migrate > Open in > Pic Scanner Gold. Check that everything has transferred over to Pic Scanner Gold. After this, delete Pic Scanner (or at least Originals) to free up space on your device and avoid duplication. How to transfer Pic Scanner Gold to a new iPhone / iPad, along with the photos, captions and albums? It’s easy. See illustrated, step-by-step procedure here. I deleted Pic Scanner Gold. Do I have to pay again to download it? No. Go to the App Store, search for Pic Scanner Gold. Tap on the Download button (Cloud with downward arrow). The app will be installed without any charge to your account. If I update to a new version of iOS or Pic Scanner Gold, will existing photos and captions be affected? As long as you don’t delete and reinstall the app, all cropped and original photos, captions and albums will remain intact. I already bought Pic Scanner. Why is there no special upgrade price for Pic Scanner Gold? Apple doesn’t allow such upgrade pricing. But trust us, you will find Pic Scanner Gold so worth it! If you don’t, you can get a full refund. If I want the app on iPhone as well as iPad, do I have to buy twice? No: if both devices use the same Apple ID, you pay only once. If you bought the app on iPhone and now want to install on iPad, tap App Store icon on iPad. Search for Pic Scanner Gold, then click download button (Cloud with downward arrow). Pic Scanner Gold will be installed on iPad at no charge. How to make a shareable album with more than 12 photos? Larger albums with more designs and features are coming soon. 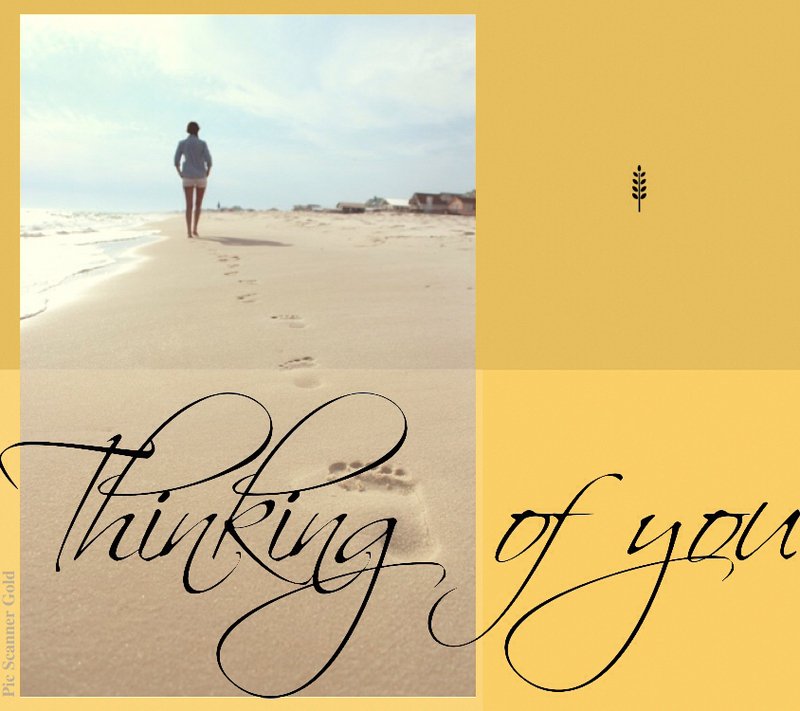 Trying to make a greeting card, but it doesn’t show the complete photo. Are you trying to fit a portrai t photo in a landscape template, or vice versa? Try another template. It says you can make ‘hundreds of variations’ of greeting cards. How? 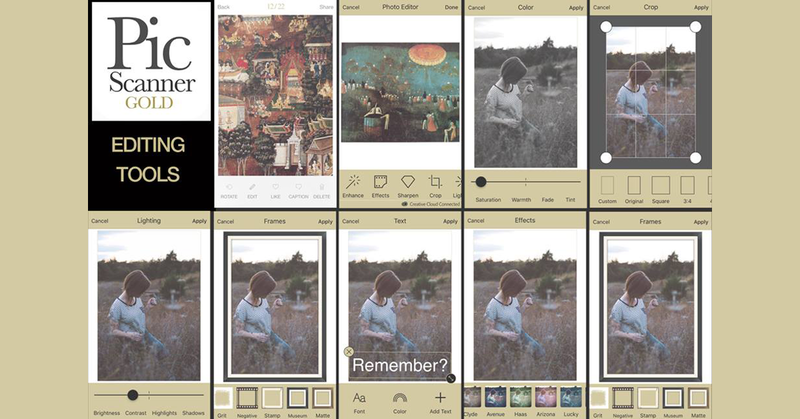 Once you have added a photo to a card template, move the slider to change the colors of the template. Is the resolution good enough for printing photos? If you plan to make reprints, scan one photo at a time (not 2 or more at a time). This will give you sufficiently high resolution scans to make 240-300 PPI (pixels per inch) prints. Trying to send message through contact form, but it says ‘Failed. Try again’. This can happen if you are not on wi-fi. To avoid this problem when away from wifi, go to Settings > Cellular, and ensure that Pic Scanner Gold is ON. Note that data charges may apply. In which format are scanned photos saved? As JPEG (.JPG) files. Scans are optimized to give best quality (pixels) with the smallest file size (bytes). I am out of space on my iPhone/iPad. What to do? Free up space by deleting unneeded original files. Tap Gallery > Originals > delete the original photos you no longer need. Why do you recommend saving scans to Photos app and deleting originals from Pic Scanner? To save space. Original (uncropped) photos are only needed for manually cropping. Otherwise you can safely delete them. Is it necessary to save scanned photos in Dropbox or computer? Yes. Archiving ensures that your photos stay safe even if you lose your iPhone or iPad – or accidentally delete Pic Scanner. How to uninstall Pic Scanner Gold? Press and hold any app icon on your device for 2 seconds. All icons will get marked (x) and start jiggling. Tap (x) on Pic Scanner Gold icon, and confirm deletion. Note that this will permanently delete your scanned photos, albums and captions. I deleted my scanned photos. Is there a way that to recover them? Yes, if you have backed them up to iTunes on your computer. Go to iTunes and see when the last back-up was done. Procedure for restoring photos is similar to this.